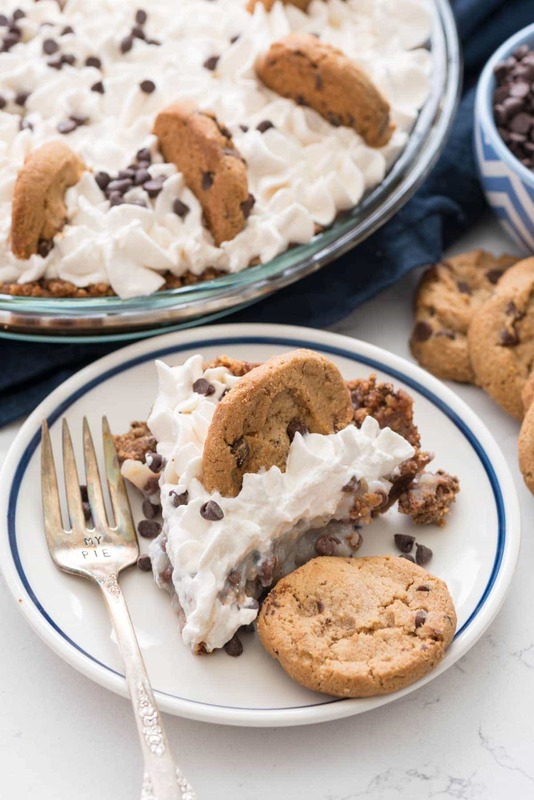 Chocolate Chip Cookie Pudding Pie – This pie has it all: it’s no-bake and it’s FULL of chocolate chip cookies. Where has this been all my life? When I finished decorating this pie I stood back and was all, Wow. I did that!! And then I jumped up and down, high fived myself, took photos, and scarfed down a slice or three. Then I went immediately to Facebook and asked someone – anyone – to take it off my hands. And no one wanted it! And I cried a little inside because I have 7 weeks until I leave for Hawaii and, well, let’s just say I bought lots of cover-ups for this trip. Then, my husband had this amazing idea to get family photos taken on the beach in Maui. I mean, perfect right? We can hang one over our mantle and I can stare at the place I want to live every single day and it’ll make me happy and make me work harder so I can actually do it. Or something? See Facebook? It’s your fault I hate the photos of myself I haven’t taken yet. In all reality, I do want to lose a few before we go. This running thing is awesome. I’m loving it. My long runs are up to 5 miles now (something I never thought I’d say). Last week I ran 5 miles in a big city circle and I learned that my city is so weird it goes up hill both directions. I made a mental note to myself to run the other direction next week. Then, after I run, I go home and I’m famished, so I eat all day. The problem is I work with dessert. Get where I’m going? My husband is going to try doing a modified Whole 30 for the next few weeks and I’m going to try and do an extra modified version. My version includes me not going ballistic without carbs and sugar, so I’ll feed the beast a bit here and there. ANYWAY, I’m very chatty today. Mel’s out of town and I haven’t talked to another adult in 3 days. 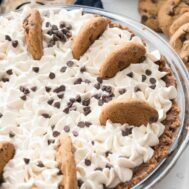 The base of this pie is a chocolate chip cookie. I suppose you could use your own, but I’m lazy. I’m all about getting help from my favorite aisle: the cookie aisle. 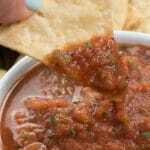 I used a generic Crunchy Chips Ahoy cookie in this recipe. And because I know you love it so much, I did some cookie math for you. 7 Crunchy Chips Ahoy Cookies (or the generic version) = about 1 cup of crushed cookie crumbs. Why is that important? Because the recipe needs 2 1/4 cups of cookie crumbs. If you’re using Chips Ahoy, that’s easy. Count out about 16 cookies, place them in a ziploc bag, and crush them with a rolling pin. But, say, you want this pie today and all you have are some Famous Amos cookies? Well, then, you’ll need to use more to get 2 1/4 cups. The moral of the story: use whatever chocolate chip cookies (and whatever flavor!) you want. Once you crush your cookies and mix them with melted butter, you press them into the bottom of a 9″ pie plate. This is kinda messy because the chocolate chips will start to melt. Don’t worry, it’ll all firm back up again. Chill the crust until your pudding is ready. Then you simply whip up a pudding mix (I used vanilla) and stir in some mini chocolate chips and more crushed cookies. Fill your crust and chill until it’s set. 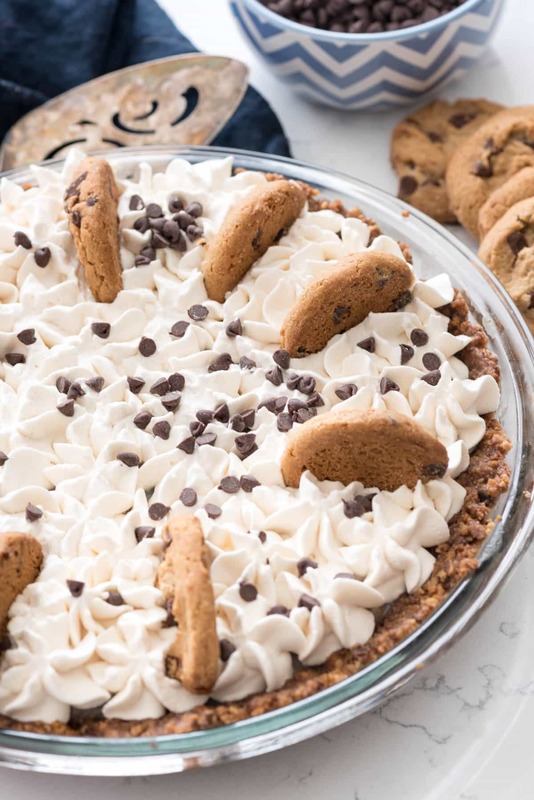 This is an EASY Chocolate Chip Cookie Pudding Pie recipe and it’s totally no bake! Plus it’s totally adaptable to fit your liking. Make this sugar-free by using sugar-free cookies, pudding mix, chocolate chips, and whipped topping. Use any flavor chocolate chip cookie (Chips Ahoy has so many different ones now). Mix up the pudding flavors: chocolate, banana, cheesecake…you name it! 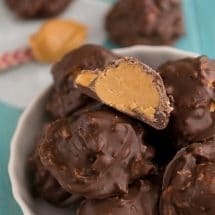 You could even add candy or nuts! 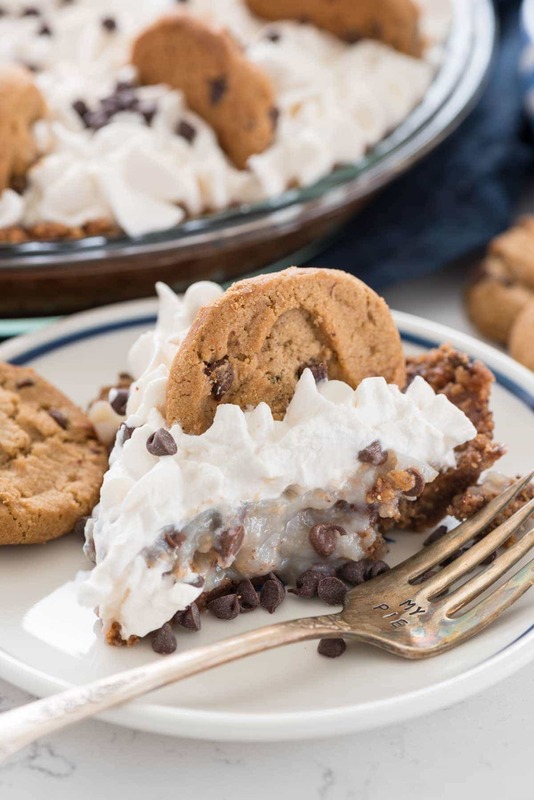 This Chocolate Chip Cookie Pudding Pie is completely no bake and so easy to make! 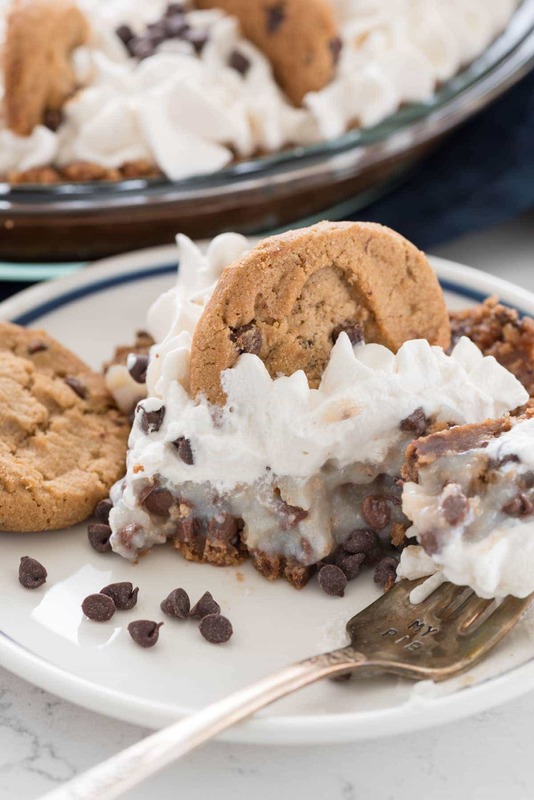 A chocolate chip cookie crust is filled with pudding - a delicious recipe! Note: About 7 Chips Ahoy cookies (regular or generic) is about 1 cup of cookie crumbs when crushed. Crush 16 cookies with a rolling pin in a ziploc bag and then measure out 2 1/4 cups of crumbs. Stir cookie crumbs with melted butter. Press into the bottom and up the sides of a 9” pie plate. Chill at least 30 minutes before filling. 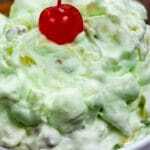 Whisk pudding mix and milk. Let sit for 5 minutes to thicken. Stir in chocolate chips. Crush remaining two cookies and stir into pudding mixture. Pour into prepared pie plate. Cover and chill for at least 4 hours or overnight. 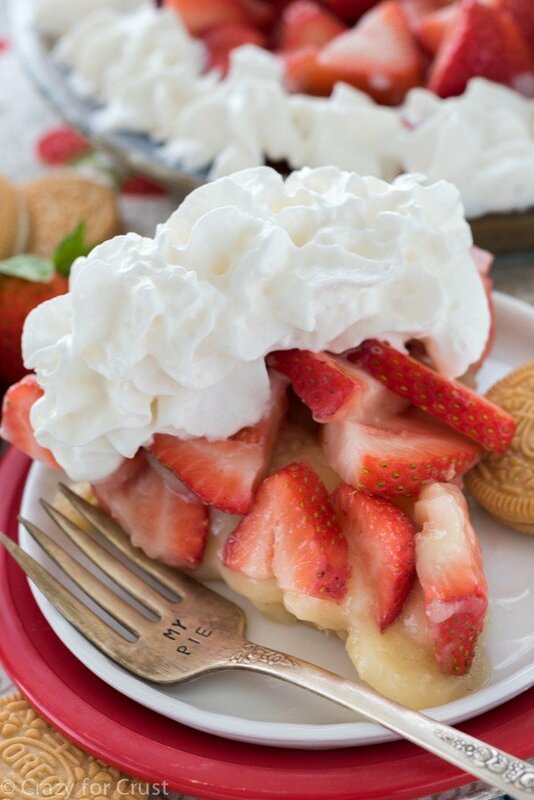 The pie, without whipped cream, can be stored covered for up to 2 days in the refrigerator. Once the pie has the whipped cream on it (if you’re using fresh whipped cream), serve within 24 hours. 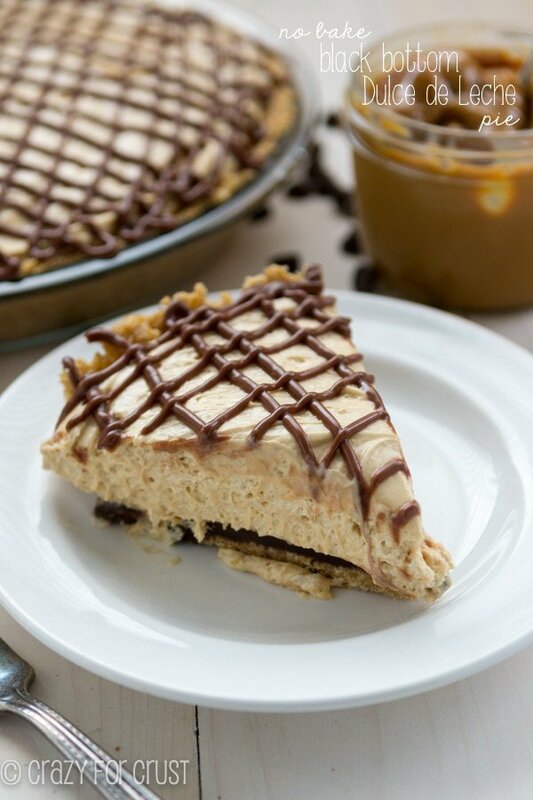 Check out The Complete List of No Bake Pies! 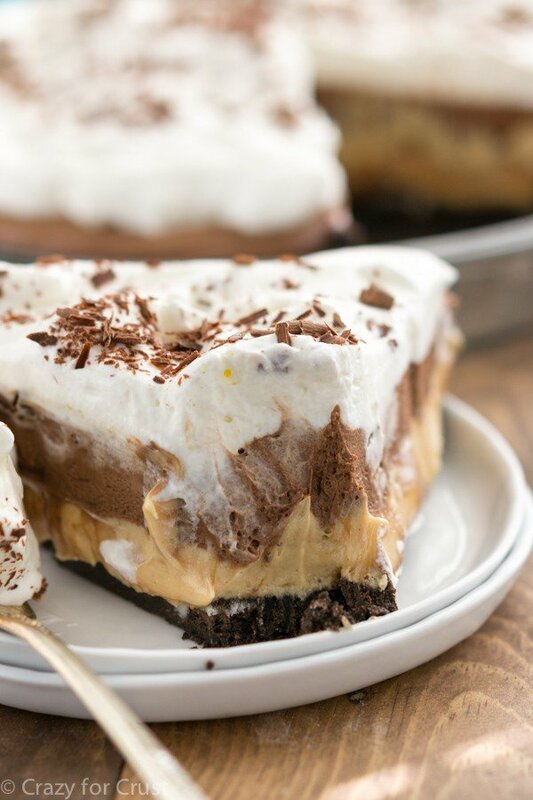 You had me at no-bake, and then you had me at cookie pie! This looks SO good, Dorothy! Wishing I had this for breakfast! Wait, what? Nobody wanted this? People are crazy. Good on you for the running! And calories don’t count in Hawaii. And now all I want for an afternoon snack is a slice of this pie! Love the chocolate chip cookie crust! I mean can you not. I`m over here trying to lose weight over here and you have to go and combine cookies with pie. I`m sitting here drooling on my keyboard. Thank you for dreaming up this combination! 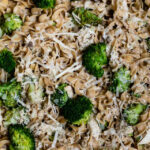 It looks amazing and I cannot wait to make a gluten free version for Sunday dinner. 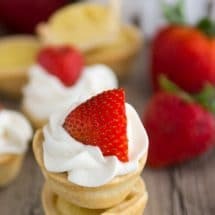 You always have the best recipes and they are practical for everyday life. 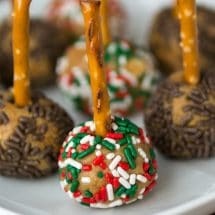 I’ll definitely be making this this weekend, maybe with chocolate AND vanilla pudding. I’m so glad you like them! Thank you! Enjoy! Please do!! Think of how fat we’d get! IF you are what you eat, I want to be this. LOVE! I’m jealous that you like running. I HATE running. I’m also jealous that I don’t live closer and thusly I couldn’t just come over and take this pie off your hands. IT LOOKS SO DANGED GOOOD! The pie looks so good~~ Thank you for sharing the recipe! 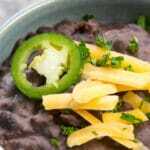 I will definitely try this recipe this weekend >.< Can't wait! I want your “my pie” fork!!! My kids tease me about how much I like pie…. And this recipe sounds AWESOME. Seriously…where can I get one of those forks?